What if wearing a veil in the presence of God was the only thing you could do to show reverence for the Eucharist? Tani of Surrender the Brownies shared something yesterday that really struck my heart. Maybe you veiled for the first time today, or are thinking about it but the apprehension over doing something no one else does hasn't quieted down yet. Maybe you've been veiling for a long time but still remember the doubts that crept up leading up to your decision, or even after it, by comments or glares from well-intentioned friends, or even strangers, who didn't understand. I think our minds tend blow our worries out of proportion, and it isn't until someone puts everything into perspective for us - someone who has a completely different take on life because of the difficulties they have encountered - that we realize what really matters. My friend Mike [check out his blog, Quicumque Vult] said something really profound today... he has cerebral palsy, and is in a wheelchair. He always dresses to the nines (suit, tie, polished shoes) for mass though, because he can't kneel or stand during the Mass, and he said that dressing well is the one way he can outwardly show respect to God and especially to the Eucharist. This really resonates with me, because that's the same reason that I veil - I'm also disabled (degenerative joint disease,) and can barely walk some days, much less kneel or stand for more than a minute or so at a time. I veil because it's the greatest way I have to show respect to God in Mass. Thankfully, though, as Mike said, the Lord reads the heart rather than the external. We are often so apprehensive about showing greater reverence to Our Lord, who is really, truly and substantially present in the Most Blessed Sacrament, that we fail to realize that this is not about us - it is about Him. When I started veiling four years ago, my worry was being ridiculed in the minds of others for looking "too pious." Considering the amazing gift of Himself that Jesus left us in the Eucharist, though, I have to ask: doesn't He deserve everything? And shouldn't we act like we believe what we believe? 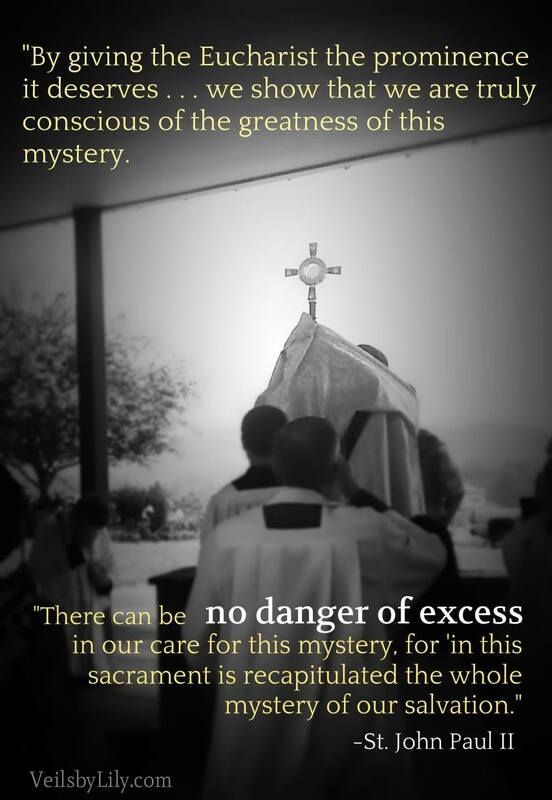 It's telling that St. John Paul II saw the need to address the question of whether there is such a thing as "excess" in the care and reverence we show the Eucharist. In line with the reverence for the Eucharist promoted Holy Mother Church, let's follow Tani and Mike's example and be willing to give Him everything.